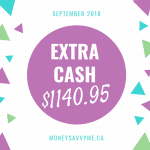 If you’ve been following my blog for a while, or just flip back through a bit, you will likely notice that on many of my Monthly Extra Income Reports I have included SCOP (Scanning Code of Practice) savings. 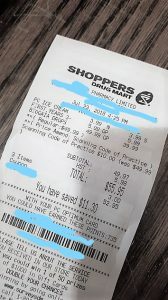 If you’re new to the world of couponing/deal finding/frugal living in Canada this acronym may have you scratching your head at what a SCOP is and how it works! SCOP is an acronym for Scanning Code of Practice, which is a voluntary price correction policy that some stores voluntarily participate in (i.e. Walmart, Shoppers Drugmart, No Frills, etc). If you’re not sure if your store participates, you can simply ask the cashier the next time that you check out, or look for a little sign attached to the cash register indicating that the store does in fact participate. So that’s all well and good, but you may be wondering, well what exactly is a SCOP or the Scanning Code of Practice? Quite simply, it is a policy that indicates if an item rings up for more than the advertised price, then the item is free up to $10. What if my item is more than $10? Well then, you get $10 off! If you take a look at the picture above, you will see that the SCOP took $10 off the item that was $49.99! How do I know if I am eligible for the Scanning Code of Practice? Pay attention while the cashier is ringing up your items and if you see a mistake point it out to them. They should verify the correct price and if in fact it is a mistake, simply and politely remind or ask if the store follows the Scanning Code of Practice. If the cashier says no, and there is a clearly visible sign, you can nicely point it out to them. Remember, some cashiers are new and not many people take advantage of this policy, so they may have forgotten about it. What if I don’t notice a price mistake until after I’ve paid? Can I still get a SCOP? You can go back and ask for a SCOP. Depending on the store (i.e. Walmart), you may have to go to Customer Service desk as cashiers may not be able to process the SCOP for you. If you’re already home, you’ll have to decide if it’s worth your time to go back to the store to claim a SCOP. So there you have it! Be sure to pay attention to your purchases and if there is any price discrepancies, point them out and get some money off your bill! Next Win $100 in Usborne Books!